This is a long story, but I will try to summarize. In 2010 Coach and I took the kids to Yellowstone. Curly was 2.5 years old. While we were planning that trip, I asked my dad for some tips- like, what part of the park should we stay in, etc. He had taken my brother Mike and I to Yellowstone when we were in high school. Our brother, Pat, had gone to Ireland (I think more than once) to compete for music, so this was our 'boobie-prize' trip. Our high school aged cousin, Denny, also came to Yellowstone with us. While planning my '10 trip, Dad emailed me and asked me if I thought I might need an official tour guide. Because nothing gets by me, I understood by reading between the lines that he wanted to come with us. I emailed back and said, 'Why do you know of a good tour guide?' - but let's be clear: I NEVER INVITED HIM. He never mentioned it again. Neither did I. I guess I didn't really take him seriously. 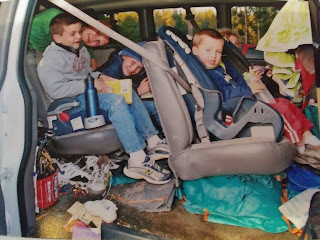 My dad is not a very patient man, and he never would have survived traveling with Coach and I and our 6 'active' children on this long, road-trip. At Christmas that year, my brother Mike gave my dad an insulated water jug - like the kind you take on a hike. Someone called out, 'That'll be great for your trip.' Clueless me asked, 'Oh, where are you going?' My siblings looked at me with great confusion. (like, different than the normal looks of confusion they give me). Well, it turns out that Dad thought he was going to Yellowstone with Coach and I. Talk about a Christmas buzz kill. (Not as bad as Dad's Christmas buzz kill two years ago, mind you). My siblings thought I was awful. There was not really an easy way of explaining my point of view. The remainder of the day consisted of 'poor dad' sentiments and long stares in my general direction. What the heck? Anyway, I felt I more than made up for it by bringing dad to Glacier National Park in '16 where we saw several moose and grizzlies, etc. Then Mini told my dad a year or two ago that we hoped to return to Yellowstone. It has been our favorite national park to date. Dad reached out to me and asked if he could tag along to Yellowstone, if and when I went. Coach was poo-pooing the Yellowstone plan. 'We've already been there,' he argued. I told him he didn't have to go, although how in the world would I manage to drive the great white or even the minivan in the mountains without him? for times when Coach is on hand. Typically one reserves a place to stay in Yellowstone a year in advance. I tried to get reservations, but ended up with crappy accommodations, A few reservations I grabbed included 'rough riders' - which meant that the cabin was equipped with a couple of double beds but the bathroom was shared. The guest would need to leave the cabin and walk down a path to a bathroom utilized by other guests from neighboring cabins - similar to the setup for campers. Dad was not on board. Then we ended up traveling to Scotland. We cancelled our '18 Yellowstone reservations and agreed to call the day the bookings opened on the first day of the season for summer '19. I believe it was May 1st. I was able to reserve two different weeks in July of '19. One week at Roosevelt, which is our preferred lodging. One week at Canyon. Then a few things happened. Like Coach's amnesia, my kids' schedules, and Irish dancing. So, read on (posting the next part tomorrow!) and then be prepared to give me direction. Come on people, I need you! wait, isn't that a story for the general public? which came first Gettysburg or the headache? wait which 'eye' / 'i' are we talking about?